Funny! I rarely give to someone on the street but instead give something to charities every month. I believe giving to a homeless charity is the official advice. I wonder how much this guy would give to another homeless person who had no money at all,if the other guy asked him for some money out of one of his dishes ? 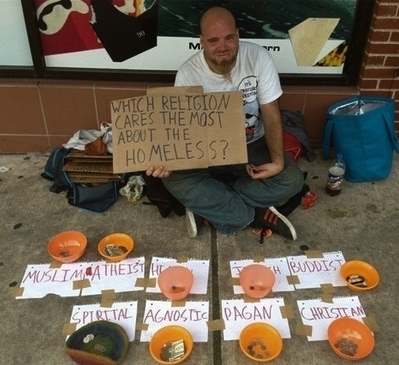 I don't know in which bowl I'd put my money, if I felt he was genuine. It IS a clever sales pitch. There's a busy corner in our town where, when the recession here first began, the homeless would gather with their signs. It's sad. It is sad that anyone should be on the streets, but it's difficult to know what to do. Do you give money or not? For the first time we've had someone in our main shopping centre claiming to be homeless. Someone we know offered to buy him some food, or a meal but the reply was that he only wanted cash. Maybe the money this guy is getting just goes to a drug habit,another bottle of wine,or a losing horse,so all you may be contributing to is his habit anyway ? You are very right. As per my reply to Trish and the guy in our town only wanting cash not food. The feeling is that he has a habit - still sad though. The first thing I do is ask the Lord, of my understanding, to lead me. Only He knows the heart of that person and their need. He knows exactly what the person will do with whatever I give. I remember one guy stood there waiting and all I had was 4 pennies. "What? That's all you have? No bills? Even I have a ten-spot!" He was visibly upset. That's when I told him that if he had bills, he was better off than me. I put away my 4 pennies and left. As for the homeless guy's bowls - seems manipulative. People are better motivated by love and honesty. Oh well. I guess the bowls are manipulative, hadn't really seen that. I like the principle of asking for guidance in such situations. ive come to realize that i dont have to be concerned with "what will this person do with it" when i give. thats between them and GOD. when i say "im a servant of the Lord, heres a few bucks", im helping the Lord to feed one of his children, or it shows a lost person the LIGHT OF A CHRISTIAN. Proverb 19:17 is a fact.